One of the most amazing things about the jailbreak community in our opinion, is the sheer diversity which it represents. When we talk about diversity, we mean that in all contexts, spanning from the range of tweaks available on the Cydia store, all the way to the cultural and age diversity of the developers who submit them. Cydia contains software and modifications of all genres which can pretty much tweak, theme and alter nearly all aspects of iOS, but somehow developers still manage to keep churning out unique ideas. One such modification, which has been around for a while, is called iSounds and hooks into iOS in a way which we haven’t seen implemented before. Vladislav Korotnev, the developer of iSounds advertises the application as the app which makes an iPhone an iPhone, and although we aren’t quite sure what he means by that, it does certainly offer a feature set which we are yet to see in any other tweak or application. The primary function of iSounds is to give the user the ability to set custom sounds to activate when certain interface actions occur, which could range from an application being launched, a folder opening or even the volume button being pushed. 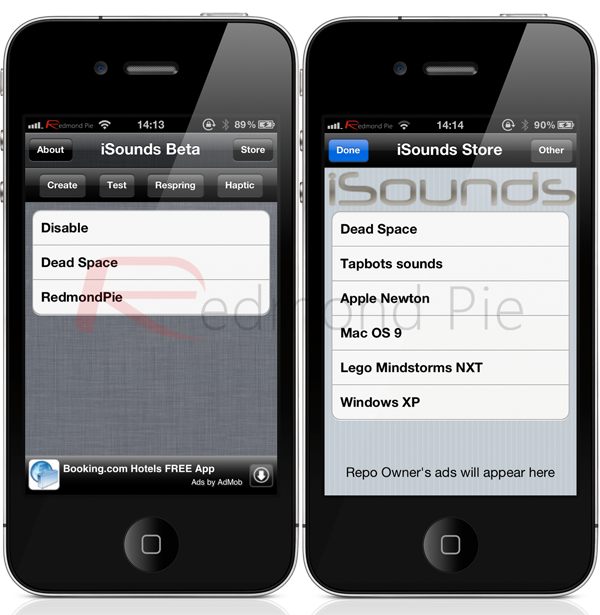 iSounds works on the basis that the user needs to download a sound pack(s) from the integrated iSounds Store, which can be accessed through the new icon which appears on the device’s SpringBoard after launch. Once the sound pack has been downloaded, it the becomes available to use within iSounds, allowing the user to create a custom profile with its own set of sounds assigned to different interface actions. It appears that unlimited profiles can be created, and then activated and deactivated at will, meaning different sounds can play when certain actions are invoked depending on the situation. We imagine this would be particularly beneficial to users wanting to create modes when they are in meetings or at home. The user interface of the iSounds application is a little cluttered and can be confusing upon first exploration, but after a few minutes of trying out the different views and buttons, it does become clear what each section is for. It also features an experimental haptic feedback feature which could be quite useful for a lot of users. For those that don’t know, haptic feedback is often referred to as haptics and essentially gives feedback to the user to confirm that a button has been touched or an action has taken place which in this case comes through in the form of a short vibration. From a personal point of view, I am not sure if I would like my iPhone to have sound effects when I perform regular tasks like launching applications or swiping from one home screen to the next. Although I can definitely see the benefits that it would provide for certain actions like increasing or decreasing the volume, which I would like to see mimic the tone made in Mac OS X when the volume is changed. The haptic feedback option seems to work quite well, and if the right sound pack is downloaded and mixed together with the right profile creation, iSounds certainly can provide a significant enhancement to iOS. Going forward, I would like to see the developer simplify the user interface a little and provide something a little less cluttered. iSounds is available free of charge from the BigBoss repository and although it doesn’t provide any compatibility requirements, we have tested said tweak with an iPhone 4S running iOS 5.0.1 only. This Tweak For iPhone Lets You Add Rich Text Support To The Native iOS Notes App – Download Now!